Lead Vocals (Tom) were recorded using a Warm Audio WA47 in the main studio with minimal sound treatment. We then moved him into the toilet to record 'Hotel' with a bit of ambient echo sound. Craig and Paul then joined him to record some backing vocals. 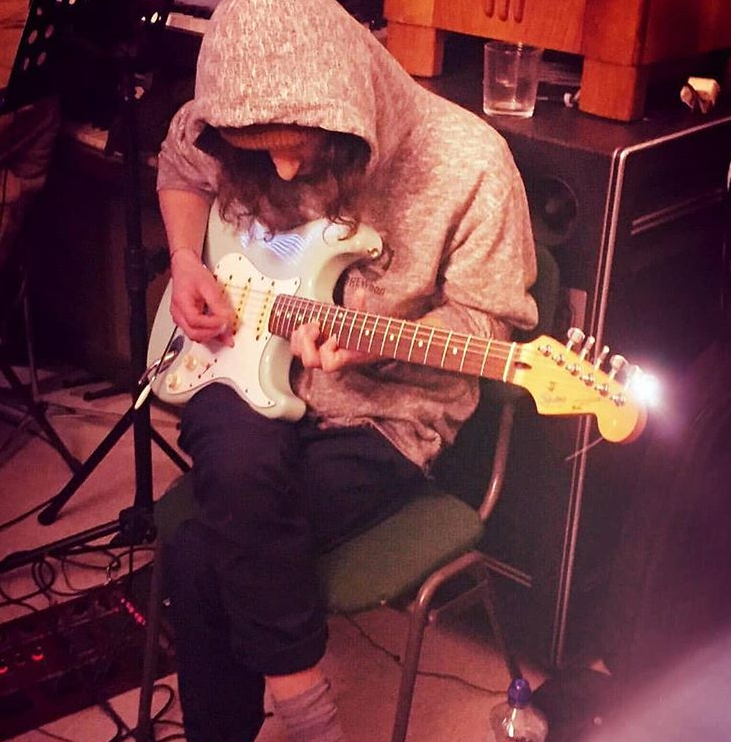 I received a phonecall from Tom Stanton back in December 2018, asking about availability for a 5 piece band to come and record a demo at Vintage Keys Studio. After Christmas and New Year was out of the way, Tom, Jim, Craig, Paul and Ken, otherwise known as Heroes of the Modern World arrived at Vintage Keys on Saturday 19th January 2019 to begin recording. The plan for day one was to get the rhythm tracks down, recording the Lead Guitar, Rhythm Guitar, Bass and Drums all live. Ken and the studio drumkit (a 1964 Drummate) were in studio 2 with our Steinway, and copious absorbant rugs and screens. The kit was miked with some Audix i5's, a D6 about a foot away from the kick drum head, an Oktava 012 on the hi-hat, and Rode K 2 Tube condensor on cymbals (not exactly 'overhead'). We achieved a very crisp, solid drum sound, with a nice balance between all elements of the kit. Jim and Tom played guitars in studio one, with Craig laying down a rough bass track which was overdubbed later that day. We had many amps at our dispoal, but after some tests with our Antelope Audio Discrete 4 and Orion Studio class A preamps, line inputs and digital converters, we decided to DI all the guitars and bass through these units, and use Logic Pro X's amazing array of amp simulators for the majority of guitar and bass sounds. The possibility of reamping later on is always there, which we could have done had we wanted to. The three tracks recorded were 'Chime', 'Kodiak' and 'Hotel'. The first two quite punchy indie/pop with some great Led Zep John Bonham style breakdowns in the drums, and the latter a slow, introspective Indie ballad. After day one we had a great sound, with a very clear and punch drumkit and perfect bass and guitars. We also had a rough guide vocal recorded live at the time. Day 2 involved overdubbing Paul's keyboards. At Vintage Keys, we have a whole plethora of amazing keyboards, and Paul seemed a little bewildered at first, but very enthusiastic to get straight on the Hammond M102! He recorded that on 'Hotel', through our hybrid Leslie 125/M3 which looks and sounds like 122. Next up, he had spotted our 1956 Ondioline and decided to use that sound on 'Kodiak', using a harsh timbre in the 3rd octave from the bottom, using some of the instruments many tone filters in an interesting way to add colour. Mixing was done on Logic Pro X on a Mac, through our Allen and Heath ZED 16 digital/analog mixer, with the Antelope Audio gear and a Canford Audio CC3 mixer for the reverb feeds. Outboard gear used included a 1958 RCA Orthophonic Preamp, A 1960 Vortexion 15/4/M mixer and a Leak Varislope Mono preamp. We used our studio stereo spring reverb live, as well as a Melos Echo Chamber (tape delay) to delay the reverb send. This can be heard most prominently on 'Chime' on Paul's Wandering Genie track. Our studio monitors are a couple of large JBLs, run via a 1979 H and H electronics V200 mosfet amp, and a pair of Yamaha HS 7’s. The only plugin used on Logic was Waves' 'Puigchild' compressor/limiter, which is always very handy, to keep the signal as clean as possible without swamping it with unnecessary processing. The tracks will be available very soon to listen to, and this page will be updated in the next week or so. For more information on our services, prices or booking availability, please call Steve Christie on 07530 532767. Our studio is in the New Forest, just outside of Southampton.